Last night, long past the sunset, I was wrapping things up at my co-working space. I paused for a moment (to perk up the air with Weezer’s new cover album on YouTube) and started chatting with the other member who was there late. After swapping intros, with a laugh she said that my story was an ‘Oprah Story’ – a great example of following your dreams. Ha! Like most people, I feel like my own story is pretty much the most mundane one around. It’s always been with me and I’m used to it! A few short months ago this comment would have made me uncomfortable, but this time I smiled. It was perfect timing given my decision to send this to you today. 2019 marks a new phase in my journey of contributing to the movement of designing sustainable, innovative businesses that have impact baked into their core. And it’s my best year yet! I’m at a point where I have the privilege of needing to pinch myself when I think about the past, present, and future of my career – because it all feels altogether way too awesome to be my real life. It’s hasn’t been a smooth ride by any means. But if having today and the possibilities of tomorrow is the outcome of all those rough patches, then I wouldn’t trade any single moment. The real story of my social entrepreneurship journey will take you across continents, countless iterations, through the birth and death of a side business, the rebirth of the same business in new skin, and it ends (for now at least) with a surprising twist — one that I’m willing to bet you won’t see coming given my relentless passion for all things entrepreneurship. It officially began six years ago (although really much earlier as you’ll learn) but it’s not until now that it finally feels like the perfect time to share my story so far. I’ve been reluctant to share much before, so it’s long overdue. 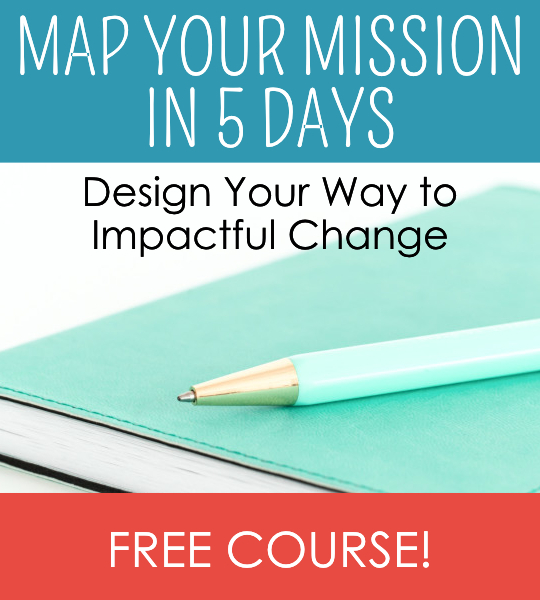 I’m currently making a huge shift in my career and want to share my thought process with you; I hope it provides another data point from which to learn and integrate into your own journey and decisions as a changemaker. I personally love hearing ‘behind-the-scenes’ from other entrepreneurs. It makes my own ups and downs, and twists and turns, feel normal. My hope is that sharing can provide you with similar comfort. Reassurance that you are not alone in this wild ride, that things have a way of falling into place even if it feels like nothing quite makes sense along the way, and that you have full permission to ignore all the naysayers and follow your dreams to be part of a more wonderful world. I’ll release a new part of the series every week for five weeks, starting today. Let’s dive in! I’ve never been one to feel limited by conventions or by constraints that dictate ‘the way things should be done’. …Maybe it was growing up in an unconventional family, where a lack of siblings was more than made up for by a multitude of related and unrelated aunts, uncles, and close family friends. An unconventional family where my parents never married or lived together during my life. Where my single mom always worked in professional jobs – until she didn’t for 7 years due to a chronic illness. An illness that slams people to a halt but somehow didn’t stop her from (slowly) pursuing a Ph.D. in an unconventional field of study (integrative healthcare and energy medicine) and from being one of an extremely small percentage (less than 10%) that experiences recovery. …Maybe it was being part of the snowflake generation where every kid received a gold star for effort and praise for being special, instilling the belief that no matter what you did, it would still be rewarded in some shape or form regardless of merit. …Maybe it was feeling for most of my life that I never quite fit in with any group. I was a bit of a nerd, but not very bookworm-y or studious, smart enough to get by without a ton of effort, but never top of my class. I definitely wasn’t cool or popular. I looked athletic enough to make junior high sports teams but wasn’t sporty enough to stick to anything other than the swim team (a pretty loner sport if you think about it…) Feeling somewhat out of place gave me the opportunity to become a practiced observer of others, rather than being the center of attention. From a young age, this gave me time to take notice, perhaps more than the average person, of just how colorful and wide-reaching the range of human experience and possibility really is. But more than anything else, I think I just like being different. In art class, sometime around grade five, I distinctly remember feeling a swell of pride after egging on one of my teachers until she finally said I was ‘weird’. Call me a weirdo, but I loved that I was outside-of-the-box-enough to be categorized as such, and still do today. It must be for some combination of all these reasons, and many more I’m not yet aware of, that I flat out reject the premise that there is a ‘proper way to do things’. It must be why I am so drawn to entrepreneurship where you get to make up your own rules and are rewarded for doing things differently. And why I am drawn especially to the vein of entrepreneurship where innovation and solutions are used to power positive change. It must also be why I felt like I was living a double life for the nearly three years after graduating when I took on my first ‘real career job’. Partially because it’s the easiest option for a good business student grad — and partially because it happened to be the first and only job I applied for — before I even graduated I landed in the service of helping a clientele that primarily fit into the category of ‘old rich white guys looking to get wealthier’. You guessed it – commercial banking. Quick side note… While I wouldn’t be surprised if our global economic and financial system crumbled in my lifetime, I don’t have anything against banking in general. In the spirit of providing a useful service, you can’t deny that it’s helpful. To a point of course. Although, I don’t like blaming systems and corporations without accounting for the millions of individual PEOPLE who make decisions every day to uphold the very same systems and corporations. But that debate is an entirely long-winded discussion for another time! Needless to say, I was planning my escape from the banking world from the very same day that I signed my offer letter. I was young and inexperienced but knew that any experience, no matter how mismatched it was to my values, would be worthwhile. As it turned out, for me the value of entering my career as a banker was that, outside of work hours, it sent me running in pursuit of alternatives to combat the misaligned values I endured from 9-5. Discouraged from a string of failed job application attempts to break into the nonprofit sector, I enrolled in an online certificate in Social Entrepreneurship. I channeled 100% of my non-banking self into the readings and assignments. I eventually emerged with an arsenal of proof that amazing people were building amazingly cool social innovations around the globe. I also emerged with a half-baked business plan for the Sedge. 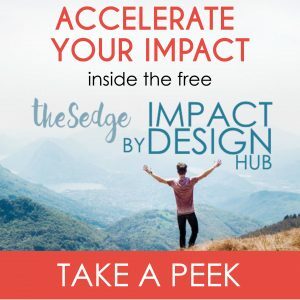 Since the beginning, I imagined the Sedge being the community hub that I craved to tap into myself — a global platform that would facilitate knowledge exchange of social enterprise ideas and business models among those crazy enough to try it. In the spirit of my diehard belief that anything is possible if you decide so, a daydreamy conversation with my then-boyfriend now-husband started a chain reaction of events that led us to pack up our lives and move south to Chile for six months in 2013. Jordan convinced me that, due to sharing a similar distance from the equator, Chile (part of it at least) had similar geography to that of his home province on the West side of Canada. We often daydreamed about taking off on a travel adventure and Jordan seemed to think that Chile would have the perfect coastline to grow his list of cool fly fishing spots. Amused, I did some research about the state of social entrepreneurship in Chile and landed on a blog post about Start Up Chile. Turns out Start Up Chile was a fairly new startup accelerator program awarding new startups a full grant to cover company growth and living expenses for six months in Santiago. It took no equity and it seemed too good to be true. Out of only a handful of blog posts validating that it was in fact, true, one happened to be from a social startup. I wanted the opportunity to leap into this new world so badly that I’m positive I willed it into existence through sheer willpower and determination. Every night before falling asleep I dreamt what it would mean, and what it could look like, to shed my ‘double life identity’ and live life to the fullest without the mismatched part. I remember waking up every morning feeling certainty deep in my bones that it would become a reality. My job wasn’t so much figuring out how to make it all happen, it was more figuring out what fun experiments to pour myself into so the inevitable reality could finally come out and play – and then letting go enough to allow it to unfold. If you decide you want something, don’t let convention or past ‘evidence’ tell you that you can’t, or shouldn’t, go for it. The moment you loosen your grip on convention is the same moment you start planting new seeds of possibility. That’s the perfect storm of how I launched into this social entrepreneurship journey! Next week in Part 2 I’ll share how my business and changemaking work took on so many identities and experiments that I can barely count them all. I’ll share how this enormous pile of imperfect steps and decisions all helped me get perfectly to where I am today. I’ll also share how I hit the most challenging year so far (only last year), the personal and professional growing pains that I muddled through as a result, and why it was totally worth the struggle.